Once the biochar has left the pyrolysis oven or retort it is crushed to greatly increase the amount of surface are that can hold onto nutrients. Once activated with compost or other organic material, the biochar is buried in the cultivations or around the trees. In the soil it greatly enhances what is called the cation exchange capacity or CEC on soil analysis reports. This is important, because tropical soils usually are very poor and suffer from lixiviation, which means filtration or seepage of the soil, causing agrochemicals and fertilizers to often drain into nearby waterways or into the ground water, without benefitting the trees or plants. In contrast, biochar with organic fertilizers like compost or bokashi retains the nutrients in the soil, enhancing the tree's or plant's ability to make use of those nutrients. Together with organic material the biochar also increases the retention of soil humidity and promotes soil microfauna, resulting in healthier and happier trees. Traditional charcoal making is not very efficient (100 KG of charcoal for every 1 ton of biomass) and not environmentally friendly, as it releases all of the harmful green house gases (GHG's) into the atmosphere. 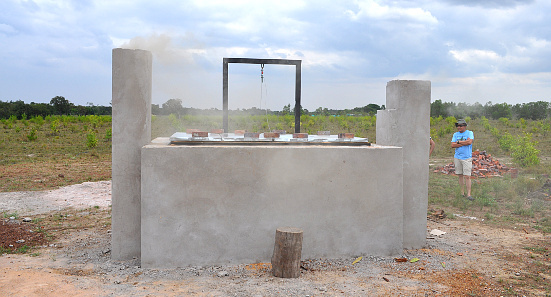 We first started experimenting with biochar using an Adams Retort, after which we decided to invest in an industrial scale biochar pyrolysis plant with three ovens, currently under construction inside the plantation. Using pyrolysis ovens charcoal production is significantly more efficient (350 to 450 KG per ton of biomass). Pruning 1 hectare of Acacia mangium results in 6 tons of biomass. Typically tree plantations also cull their lots to give better performing trees more space to grow. This means we have abundant biomass available to produce our own soil amendments, as well as some for local smallholder campesinos with the support of donors. Our objective is to have a 5 ton per day biochar production capacity by 2018. Part of our mission at Amazonia Reforestation is to promote sustainable practices in forestry and clean agriculture in the region. Biochar is a key component of that process and something we teach to and share with our neighbours in Vichada. We're presently working on the affordable design for an easy to build TLUD or Top Lit, Up Draft biochar oven out of old fuel barrels that local farmers can make. Biochar is charcoal produced at a certain temperature in a pyrolysis or low oxygen burn oven or retort that avoids harmful green house gas (GHG) emissions. GHG's are burnt off inside the oven, which is mostly self-heating. The charcoal is then activated in compost, compost teas, cow urine or other organic mediums, before being buried in the soil, where it acts to greatly improve soil nutrient retention. Terra Preta means black soil in Portuguese. Scientists investigating indigenous villages noticed that the soil was still productive 500 years after Columbus. The ancient native people had dumped their fireplace charcoal in their cultivations, resulting in Terra Preta.